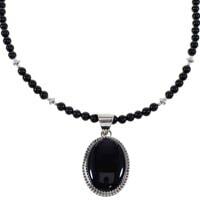 At SilverTribe, our onyx necklace collection is stunning and encompasses a wide range of styles and price ranges. We strive to provide our customers with top quality Native American onyx necklaces at the best prices possible. 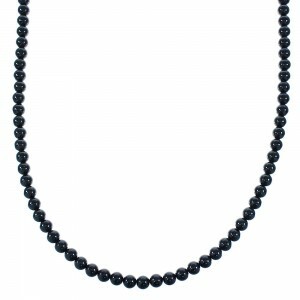 The onyx necklace is a truly versatile piece of jewelry. 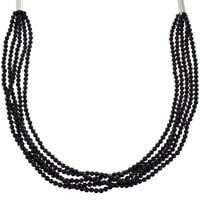 There is practically nothing that an onyx necklace can't be worn with. It will go with any outfit and its beautiful black color is always in style. Onyx is an extremely hard stone, which makes it much more difficult to work into beads and shape for pendants. As they say, nothing worth doing is ever easy. Despite the challenges, American Indian artists have been shaping this stone to make beautiful onyx necklaces in all sorts of shapes and styles for generations. Due to the hard nature of onyx and the difficulty in cutting it, its use in inlay is more seen in high-end Southwestern jewelry. Often jet and other stones that are dyed black are mistaken or just called onyx. 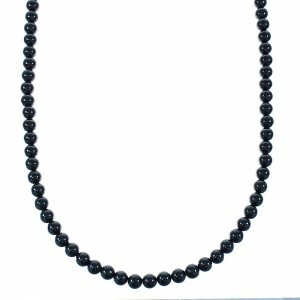 A good example of real onyx inlay can be seen in our impressive selection on onyx necklace designs. The reasons for wearing Native American onyx necklaces can be as diverse and varied as the styles available. Some people believe that the Onyx stone used in the making of these necklaces has the power to relieve depression, calm the nerves, and even focus your mind. 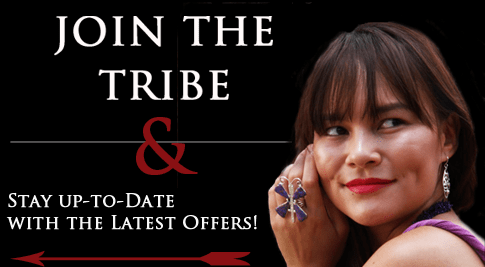 Some love the connection they have with their hand crafted onyx necklace, and take personal pride in helping to preserve some traditional aspects of Native American art and culture. Of course, onyx necklaces are very fashionable, so you really don't need to have a reason to love and wear onyx necklaces, their beauty is reason enough. 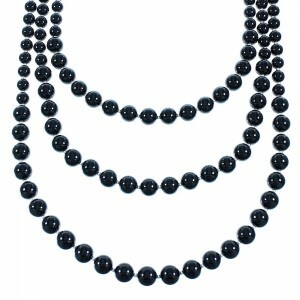 We do our best to make the broad array of onyx necklaces available and accessible, whether you are looking for a large free form onyx multi-strand necklace, a classic round onyx bead necklace or even a liquid silver onyx necklace, SilverTribe has you covered. 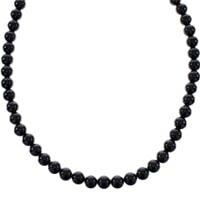 We carry some of the best handmade onyx necklace sets that feature pendants with magnificent hand cut designs. 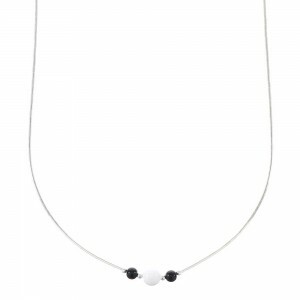 We even have the ever-popular teardrop onyx necklace. 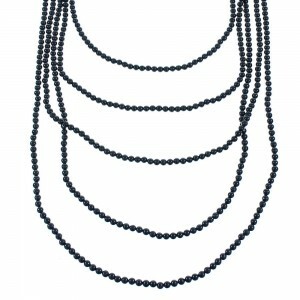 Our hand strung onyx necklaces are made out of the best materials available. 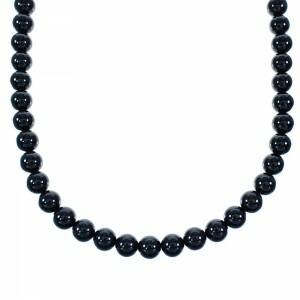 We feature only the highest quality onyx beads, genuine sterling silver, and 14K gold. 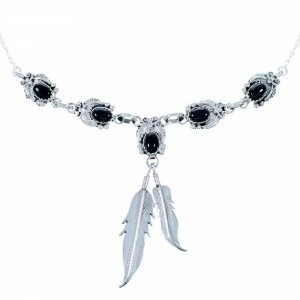 Sterling silver is the perfect complement to the elegant black onyx stone, and is used to create amazing onyx necklace and pendant sets, along with stunning onyx link necklaces. We work hard to bring you the best American Indian onyx necklaces and southwest onyx necklaces at prices low enough to fit in with every budget. Everything we sell is of the best quality; don't let the low prices fool you. You may be paying half the price you would elsewhere and you're actually getting a better product at the same time. No sacrifice for savings, it's a no brainer. Look through our Native American necklaces catalog and give us a chance, we know you will be happy with what you see.